A blue lagoon, partially enclosed by a range of mountains and cliffs, used to be a hidden gem of Ilocos Norte until eight years later when tourism infrastructure development started to flourish. Groups of tourists flock to this crescent-shaped beach in Balaoi, Pagudpud, about 85 kilometers from Laoag City, with powdery white sand and clear water that is as blue as the sky. Rain or shine, visitors come, often staying for a day or two at the blue lagoon. The tourists enjoy various water sports activities including the latest addition, a 1.7-kilometer zipline, which is the country’s longest zipline over water built by Hannah’s Beach Resort and Convention Center, a prime tourism developer in the province. This is apart from the existing 1.2-km zipline where visitors may opt to try “superman” or “seated” harness style. Retired Philippine Air Force Colonel Ricardo Nolasco, owner of Hannah’s, said they originally eyed the resort as a family vacation facility but they keep on expanding it and building more rooms to cater to the needs of its visitors. Aside from the existing 300-room capacity of Hannah’s, laborers are rushing again to finish a three-story building to accommodate more guests. He relayed that during the last summer season, they had to refuse around 3,000 individuals as they were already fully booked, but some opted to stay in tents. The development in the area pioneered by Hannah’s has also prompted other investors and even local residents to build their own resorts, and open home-stays and food establishments for the growing number of visitors. From small shanties made of light weight materials, several villagers of Maira-ira have transformed their residences as home-stays fit for guests or open up souvenir shops and restaurants. 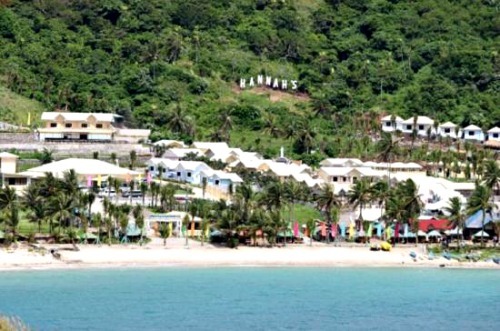 “We continuously innovate and build more edifices to satisfy our guests like our firing range, executive villas, and a big theme park comparable to other theme parks seen in neighboring countries and Europe,” Nolasco added, citing all these development efforts are anchored on making Ilocos Norte a prime destination without destroying its natural landscape.